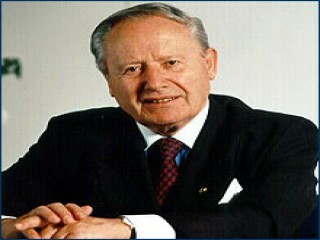 Gaston Thorn was prime minister of Luxembourg and former president (1981-1985) of the former Commission of the European Communities. His commitment to European unity proved valuable at a time when the community was plagued by increased nationalism and severe economic problems. Gaston Thorn was born in Luxembourg on September 3, 1928. He was brought up in France where his father, Edouard Thorn, was a railway engineer, but the family returned to the Grand Duchy at the outbreak of World War II. His father, a committed Liberal, was arrested for resisting Hitler's "Germanization" of Luxembourg. In 1943 the 15-year-old Thorn also spent some months in a Nazi "correction camp" for having organized a student protest at his school against compulsory antiaircraft drills and the enforced recruitment of Luxembourg citizens into the German army. At the end of the war he studied law at the universities of Montpellier, Lausanne, and Paris and was later admitted to the Luxembourg bar. He played a prominent role in student politics and was elected president of the World Conference of Students. In 1957 Thorn married Liliane Petit, a professional journalist and together they produced a son. In 1959 he became a Member of Parliament. In the same year he was also elected to the European Parliament, in which he was to remain a member for the next ten years. He served as chairman of the Parliament's Committee on African Affairs and soon became known as "Gaston The African." In 1961, he was elected the chairman of the Democratic (Liberal) Party of Luxembourg. In 1969 Thorn was appointed minister of foreign affairs, civil service, and sports in the Christian Social-Liberal coalition led by Pierre Werner. A strong believer in the European Community and an avowed Federalist, he took an active part in the activities of the Community and served as chairman of the EEC's Council of Ministers four times in ten years. He gained an unrivalled knowledge of the Community's institutions and a reputation for being able to deal with essential issues without becoming entangled in details. During this period his wife, who continued her career as a journalist, often had professional "exchanges" with him. It was quite common for her to be entertaining an official guest with her husband at one moment and asking him questions at a press conference the next. On one occasion during the oil crisis in the early 1970s she criticized the foreign ministers of the EEC (of whom her husband was one) for what she felt was a pro-Arab policy and for failing to stand up to the Arab oil producing countries. Thorn swept to power in the general elections held in Luxembourg on May 26, 1974. He became prime minister and headed a Liberal-Socialist coalition after receiving the highest total personal vote ever recorded in the nation's history. The victory of his Liberal (Democratic) Party has been aptly described as a "revolution, " as it was the first time the Christian Social Party had been defeated in 75 years. It also ended the 15-year tenure of Pierre Werner as the nation's leader and ushered in a new breed of younger politicians. Thorn became the pre-eminent symbol of this new breed—modern and pragmatic. He recognized the vital role of the media in politics and used it with great skill. While he was prime minister, Thorn continued to serve as foreign minister. Luxembourg under his leadership maintained a neutral stance on many sensitive world issues such as the Arab-lsraeli conflict and in conflicts between the members of the European Community, particularly the "Atlanticist" and "Europeanist" groups. An advocate of closer cooperation between the United States and Europe, he was also very much aware of the importance of inter-European cooperation and said that it was necessary to "break out of the dilemma that one is regarded as a bad European if one is for the Alliance, and as an unreliable member of the Alliance if one is for European unity." Thorn served as president of the 30th session of the United Nations General Assembly from 1975 to 1976. He was noted for his ability to reach compromises, and his style was one of discussion and conciliation instead of confrontation. In the Luxembourg national elections held in June 1979, there was a successful resurgence of support for the opposition Christian Social Party. Once more, Pierre Werner became head of a Christian Social-Democratic coalition government. Thorn was appointed deputy prime minister and continued to serve as foreign minister as well as having four additional portfolios: foreign trade, economic affairs, middle classes, and justice. He was also elected to the European Parliament, but had to resign his seat in order to take up his national ministerial appointments. At the Venice session of the European Council in June 1980 Thorn was nominated, with almost complete unanimity, to succeed Roy Jenkins of the United Kingdom as president of the commission of the European Communities. The only country that opposed his appointment was France, which had reservations about his reputation as a federalist and his commitment to greater supra-national powers for the Community. Nevertheless, his nomination was confirmed and he served as president from 1981 into early 1985. Later in 1985 and back in the private sector, Thorn became president of Banque Internationale in Luxembourg; in 1987 he became president and Director General of RTL, Luxembourg. Thorn sought to achieve greater economic, monetary, and political union among the members of the Community during his tenure as president. His experience of running a coalition government proved crucial in reconciling the often divergent and conflicting interests of the members of the Community. View the full website biography of Gaston Thorn.